Because baths and chillers are such a basic piece of laboratory equipment, it’s easy to put them in a corner and forget about them. But, as with other instruments, maintaining your bath or chiller is extremely important. Don’t forget to clean your air and fluid filters! He adds that a poorly maintained unit could take down a pharmaceutical manufacturer’s setup, for example, possibly leading to the loss of millions of dollars in drugs. Luckily, the most important part of caring for your chiller or bath is simply keeping the unit clean, whether that’s cleaning the air and fluid filters or the condenser. Surprisingly, cleaning is something many users fail to do. 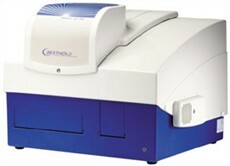 The Mithras LB 940 multimode plate reader is unique in its versatility, reliability and sensitivity. It is a modular plate reader system which can be configured for any current and future requirements. Mithras offers the biggest choice of reading technologies plus the choice of using up to 4 reagent injectors for fast and ultra-fast flash reactions as well as temperature control for longterm cellular assays. Read more about the Mithras LB 940 on the BERTHOLD website. High-throughput plant & tissue homogenizer with an adjustable clamp that accommodates a variety of formats ranging from deep-well titer plates to centrifuge tubes. Specifically designed for rapid cell disruption, lysis and tissue homogenization while preserving temperature sensitive samples. Typical samples include plant and animal tissue, cell cultures, seeds, yeast and bacteria. We're in need of a controller unit to maintain a set temperature using the Neslab CC100. Advise this member. A couple of questions: 1. What does "GT" refer to? 2. On the generators/probes, what does 92/ or 90/ or 94/ refer to? Advise this member. It is dead (can not power it on). But the loading meter needle is always on the right (maximum). Does anybody have an idea? Is there is wiring diagram available? Advise this member. Shimadzu Scientific Instruments has released a new application note that presents Headspace-GC/MS as a potential alternative to the current official method of analyzing residual solvents in pharmaceuticals using Headspace-GC-FID. The note, titled “Analysis of Residual Solvents – Class 1, Class 2A, Class 2B – in Pharmaceuticals Using Headspace-GC/MS,” explains how this new method saves time in the lab by enabling simultaneous analysis of different classes of compounds and providing simpler confirmation of compound identity. Read more. An automated dynamic light scattering system from Malvern Instruments has become established as an essential part of the analytical toolkit used by SARomics Biostructures AB, a leading provider of protein 3D structure determination and structure-based drug design services. The Zetasizer APS automated plate sampling system is supporting the systematic study of the aggregation behavior of proteins, a fundamental component of the services provided by SARomics Biostructures. Read more. The new Micronic 24-2 rack may be autoclaved several times providing considerable cost savings over consumable sample storage products. Absolute traceability and reproducibility on the 24-2 rack is ensured through alphanumeric visual location aids and a unique laser engraved barcode on the side of the rack. The open bottom design of the new storage rack facilitates quick defrosting of tissue samples. To conserve valuable storage space within freezers or when transporting, Micronic 24-2 racks with covers are stackable. Read more. Anova Water Baths (division of Anova Industries Inc.) is a US based corporation that manufactures a wide range of temperature control products for laboratory, process and culinary industries worldwide. Their products include: water bath system, refrigerated circulators, heating circulators, chillers, heat exchangers, immersion circulators and custom temperature control equipment. These systems are used in a multitude of industries, including: laboratory, biotech, lasers, pharmaceutical, plastics, chemical, and equipment cooling and restaurants. Visit the Anova website to see their full product line. I cannot find a manual on how to use this device, and my attempts to calibrate it have failed. We have a newer Hach portable pH/conductivity unit, and I would like to get similar readings on each device. Advise this member. Can not start the PCR due to error code 0x010A Advise this member. I would like to know who uses the -75 freezers from New Brunswick and if you're having any issues with them? We are having irregular temperature issues, that is a different temp in different parts of the same freezer. Is anyone else experiencing this? Advise this member.